I think I have said it just about every week, but the Buffalo Bills don’t ever seem to find a break in their schedule. Every week they play and opponent that, regardless of their record, is both tough and challenging, This week it’s no different with the Oakland Raiders come to town Sunday 1:00pm at New Era Field. Going into the season, the Raiders were looked at as one of the favorites of the AFC West, along with the Kansas City Chiefs. They got off to a fast start but then quarterback Derek Carr injured his back and missed some time. That injury helped the Raiders go on a four game losing streak but last week they came back strong to beat Kansas City in Oakland. Carr is now healthy and if last week is an indicator, than this will be a very tough challenge for the Bills. 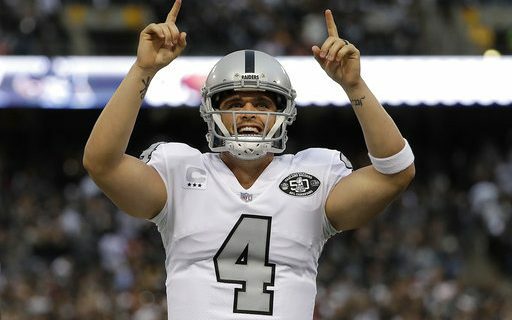 Carr may have been the fourth quarterback drafted in the 2014 NFL Draft, but he has proved time and time again that he is clearly the best player at that position. He can throw from the pocket or on the run and has excellent accuracy. The Raiders run game could be down for this game as former Bill Marshawn Lynch is suspended for the game. That means second year man Jalen Richard will most likely be the starter. Richard doesn’t have the power and big play ability that Lynch provides the Raiders offense. The receiver corps of the Raiders is excellent with wide outs Amari Cooper and Michael Crabtree, along with tight end Jared Cook. The third wide out is Seth Roberts. All are tall, fast and athletic. They will create a tough matchup problems for the Bills. Looking at the weather forecast for Sunday, it may be cool at 49 but it will also be sunny with not much wind. Look for Oakland to pass often. On paper the Raiders offensive line is very good but they have given up 13 sacks to date this season. Right tackle Marshall Newhouse is on the injury report with a foot injury, and has only had limited practice so far this week. He should be ready to go come Sunday. The Raiders defense is led by the greatest player in University at Buffalo’s history, Khalil Mack. Mack was the fifth player selected in the 2014 Draft and has lived up to the lofty draft status. Mack is one of the best pass rushers in the NFL and in less than four years already has 34.5 career sacks. He may only be 6’3- 252, but he plays much bigger with his explosive strength and power. He will give the Bills all they can handle in his first game in Buffalo since he left UB. The rest of the defensive line is very good with a combination of size, strength and athletic ability. Mario Edwards Jr. gives the Raiders another strong edge rusher, making it difficult to concentrate on just Mack. Nose tackle Justin Ellis is a big tough run stopper. The Raiders linebacker corps is one of the best in the NFL. Just last week they signed former All- Pro NaVorro Bowman. He’s a very instinctive play maker in the middle. In his first game with the Raiders, Bowman had 11 tackles after only a couple of practices. Now with another week to work in the Raider scheme he will be even better. Outside linebacker Bruce Irvin can do a lot of things well, one of which is rush the passer from his linebacker position. The secondary may be without strong safety Karl Joseph, who has yet to practice this week with a groin injury. First round pick Gareon Conley may also not play with shin injury. Conley has not played as much as hoped because of a variety of injuries. Joseph, on the other hand, is a key player for the Raiders and their leading tackler with 46 total tackles. If he can’t go it will be a huge loss for Oakland. An interesting stat for the Raiders defense is that they have not recorded an interception yet this season. As we well know, a defense that creates turnovers is a defense that helps a team win. This is another winnable game for the Bills but like I say every week, they have to be on their game both offensively and defensively to win. That means no turnovers on offense, create turnovers on defense and control the clock. Quarterback Tyrod Taylor has shown improvement in the last few weeks and has last week did a better job getting the ball to his wide receivers. This has to continue this week for the Bills to get to the 5-2 mark on the season. For more insights from longtime NFL scout Greg Gabriel, visit his author’s section at Buffalo Sports Page.